Full update instructions and downloads available here. Also, due to popular demand, Dynon now offers a Servo wiring kit for SkyView. This harness comes with everything you need to connect a servo to the SkyView network and power/ground, including an extra D9 to attach to the servo wires themselves. All of the D9 connectors are provided but not connected to the harness so that wires can be routed through tight spots. You will need a pin D-sub pin crimping tool like this as well. The SV-NET-SERVO harness is $55 and comes with 20' of Aircraft Grade Tefzel® Wiring, and is available from authorized Dynon Avionics dealers, by calling us at 425-402-0433, or via our downloadable price list/order form. 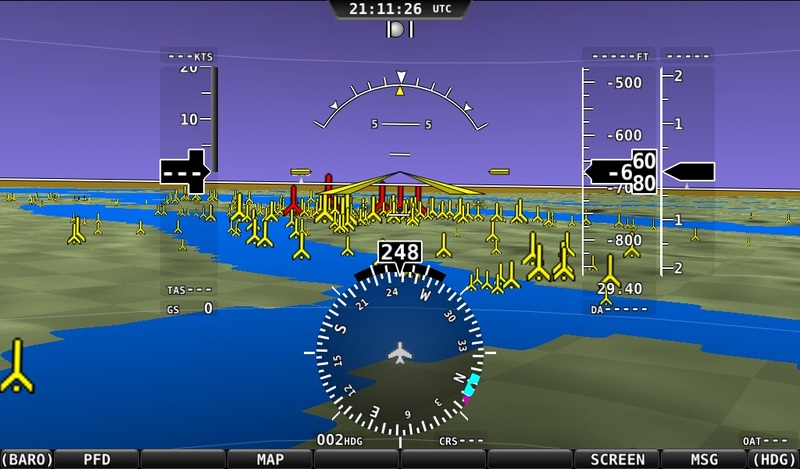 Woodinville, WA, USA, May 14, 2010 – Dynon Avionics has released Version 2.0 Software for the SkyView System. Autopilot: When equipped with Dynon Avionics servos, customers can add a full featured two axis autopilot to their SkyView system for just $1500 (mounting kits $25-$75 per axis).Includes heading hold, GPS ground track hold, NAV course following (when connected to a compatible NAV radio or GPS source), altitude hold, altitude change with discrete vertical speed control, emergency 180 degree turn capability, and more. HSI and related textual info items around it. Requires a compatible serial NAV or GPS. Includes SL30 NAV radio and NMEA/Aviation format GPS units. More robust failure handling of the SkyView network. Should module(s) or screen(s) fail, the remaining available devices will continue working normally with no action or setup steps required. This also means that unlike in the D10/D100 series and initial SkyView firmware releases, there is no "master" screen that needs any special consideration. Obstacles have been added to the map page (US only). Requires current obstacle database, available at the download page below..
Wind vector on the PFD screen. See the direction, magnitude, and crosswind component of the current wind, all computed in real-time by SkyView! 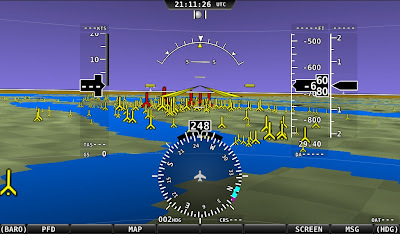 Navigation Data Details: A basic moving map displaying aviation data within the United States. This data is overlaid on the look down terrain, and shows airspaces, airports, airport identifiers, and VOR's in relation to the current location of the aircraft. Because this release does not include navigation functions, it is being offered for free. A later, $500 version will include GPS navigation functions. The data in this release is sourced from the FAA. Non-US data will be sourced from Jeppesen as soon as possible. Display Synchronization: The displays will now synchronize data, calibrations, and settings throughout the entire network. This includes altimeter settings, bugs, screen dimming, message acknowledgement, and other real-time adjustments. Also, all system settings and user-configurable data are transparently synchronized across all displays. 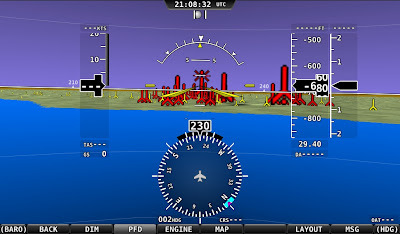 GPS Assist: GPS ground speed is automatically substituted for airspeed when the System detects that the airspeed indication has failed (usually because of an iced, blocked, or otherwise disconnected pitot). When this happens, the PFD annunciates that its attitude indication is in a “GPS Assist” mode. The EFIS display also shows GPS ground speed next to the failed airspeed indication to help the pilot maintain situational awareness. Most importantly, when in GPS Assist mode, the attitude provided by Dynon PFD continues to be accurate. Textual GPS Data: GPS ground speed and GPS altitude are now shown on the moving map. Founded in 2000, Dynon Avionics is the leading manufacturer of avionics for Experimental and Light Sport Aircraft. Continuing a tradition started with the introduction of their first Electronic Flight Information System “glass panel”, Dynon is committed to developing innovative and high-quality avionics at affordable prices for all pilots. Many prospective Dynon customers see the incredible SkyView displays and want the "latest and greatest", while others see the amazing value in the D10/D100 series of products. For those of you on the fence, here are the major differences between the two lines of products. The D10/D100 series have all of the EFIS sensors and EMS electronics built into the displays*. This means that they are mostly self contained, but also means that the screens are deeper than they could be without those parts. See the D100 and D10A specs pages for the exact depth dimensions of these products. In Contrast, the SkyView displays are just the screens and computer hardware that runs the system. The ADAHRS (Air Data / Attitude / Heading) module is mounted remotely, as is the EMS module that houses the connectors and electronics that receive individual engine sensor signals. This allows us to shrink SkyView's depth to just 2 inches! This can really help in tight panels, especially in the rear cockpits of tandem aircraft. *well, except for the magnetometer, which needs to be away from magnetic interference and is remotely mounted. Where the D100 instruments use a rear-mounted tray, SkyView uses bezel-mounted screws which typically attached to nut plates that you'll build into the panel before instrument installation. So if you already have a D100 series and are upgrading to SkyView, you will need to enlarge the cutout in your panel slightly in both directions, and you'll need to drill holes and add nut plates around the cutout for the mounting screws. The D10/D100 series comes in 4" and 7" versions, while SkyView comes in 7" and 10" versions. This allows the D10 series to go into very tight panel spaces, while the 10" SkyView screen offers an amazing view of all of all of your information. For customers in the middle of those two ends, the 7" versions of both series are very close in terms of panel space requirements. People commonly ask whether the 7" SkyView screen will fit in the same panel cutout as the D100 series instruments and the answer is no. Though the SkyView screen itself is the same size as the D100, the bezel surrounding it is a little bigger to accommodate the dual joystick knobs and the new mounting method. All Dynon displays are sunlight readable, but there are some differences here too. Customers will be happy with any of our displays, but SkyView is quite breathtaking to see in direct sunlight. If you have a chance to see one in person at a fly-in, we think you'll walk away amazed. SkyView can do everything that the D10/D100 series can, plus more. Both product lines are capable of being primary flight instruments, engine monitors, autopilots, and HSI. But, only SkyView has the ability to do synthetic vision, moving map, highway in the sky, and lots more to come. If you've been following SkyView's development and release, you'll know that we decided to release the product without a few of the above features. Autopilot and HSI are scheduled to be released May 15 if everything goes to plan, and then this summer and beyond the moving map will be added, as well as lots more exciting features. We have a SkyView roadmap page which we update with our agenda and schedule for the next couple of releases that you might find helpful. We did go back and forth for a while on adding a very rudimentary moving map to the D10/D100 series, but the hardware in those products just do not have the computing horsepower needed to create a really great user experience. In a nutshell, the D10/D100 is our low cost/high value line of products, while SkyView is Dynon's flagship offering. Most major new feature development will be concentrated in SkyView, although all Dynon products will continue to see autopilot enhancements as we develop them. You can compare pricing down to the smallest component on our full price list, but basically, an EFIS-D100 equivalent 7" screen SkyView system is about $1200 more than the EFIS-D100, and if you go for the 10" screen it's another $900 more. If you're looking at the FlightDEK-D180, the difference between it and a single screen 7" SkyView is $1800. Again, add another $900 for the 10" screen. If you're going for the full IFR setup, a FlightDEK-D180 + EFIS-D100 combination starts at $6000, while the equivalent SkyView system (two screens, dual ADAHRS, and EMS module) starts at $8000 with 7" screens. Autopilot on either generation only requires the servos, which are $1500 for a pair plus mounting kits that are typically between $0-$75 an axis. The optional AP74 autopilot control panel is available for the D10/D100 series for another $450, whereas SkyView's on-screen autopilot control scheme benefits from the dual joystick knobs and increased amount of buttons on the bezel. IFR panel? Dual SV-D700 + SV-D1000 displays + primary SV-ADARHS-200 + backup SV-ADARS-201 + SV-EMS-220. Again, "just add servos" to any configuration (except the D6 or D60) for just $1500 more. If you have any questions, don't hesitate to give us a call at 425-402-0433, or email us at info (at) dynonavionics (dot) com. ...and New York City (click for large image)!